You Are Here: Home > 2018 Jeep Renegade – Colorado Springs CO.
2018 Jeep Renegade – Colorado Springs CO.
Jeep has long made a name for itself when it comes to its SUV lineup. With notable performers such as the Wrangler, Cherokee, and Grand Cherokee, this manufacturer knows the right balance between off-road capability, interior comforts, and stellar overall performance. For people who need the right balance between all of these things, the Jeep Renegade might just be the best option. As the smallest SUV in the lineup, the Renegade presents an affordable, no-frills vehicle option for those who may want to dabble in the Jeep experience. Introduced in 2015, the Jeep Renegade has many of the same performance features as the other SUV models such as a four-wheel-drive system, upgraded suspension, high ground clearance, and more. It manages to decrease the price tag with a more basic level trim that skips a lot of the fancy convenience features found in the upper models. Despite this, it still presents a complete package at a more affordable price point. Common features throughout the trims include Bluetooth connectivity via the Uconnect infotainment system, remote keyless entry with power locking doors, optional air conditioning and an upgraded audio system. With the 2018 model year, Jeep has decided to continue on with this successful recipe for entry-level customers. As a result, most of the changes include slight tweaks to the inside and outside of the vehicle without any major style refresh. For the 2018 model, most of the changes Jeep has made to this vehicle are related to the interior features that provide additional safety and comfort while driving on or off the road. Many of these features were once optional and have become standard all the way to the baseline trim of the Sport. Several controls such as the Selec-Terrain knob have been repositioned for better ergonomic reach while driving. Many of the USB charging ports in the front have also been relocated to allow for more room and storage in the space. To fit in line with Jeep’s other SUV options, the backup camera has now become standard on all trims to increase driver awareness while operating the car in reverse. Another notable overhaul for 2018 is the infotainment system. The base model such as the Sport trim now uses a 5-inch touchscreen with the option of a 7-inch panel integrated with Apple CarPlay and Android Auto. This larger system comes standard on the Latitude, Limited, and Trailhawk trims. For anyone wanting the most out of their infotainment system, all the trims but the base Sport have the option to upgrade to an 8.4 inch LCD panel with included navigation. Finally, the removable roof system has gone through a minor change. The MySky roof now includes a two-panel system to make it easier to retract or remove on the go. This roof can still be removed manually or with the optional powered retracting system. One thing Jeep does well with all of its offerings is providing a buffet of options for potential customers to choose. With different trims focused on upgraded features, off-roading capabilities, or general performance, customers can choose the right model and level for their budget and personal preferences. While keeping the same basic platform, these different options also allows Jeep to expand the versatility of the Renegade line without creating another SUV altogether. The Jeep Renegade trim lineup starts with the basic Sport model which includes a 1.4L multi air turbocharged inline four-cylinder engine and six-speed manual transmission. Interior features on this model are limited to save on extra costs. For example, you won’t find an air conditioner unless you tack on the additional Power and Air group package which also includes powered windows. The vehicle can also be expanded for a better audio system and infotainment connectivity. Moving up, the Latitude sports most of the standard equipment found on the base model with the addition of 17-inch alloy wheels, upgraded Uconnect infotainment system with USB ports, and a 5-inch color display with voice recognition control. The roof has the “MySky” sunroof panels which can be removed manually or automatically using the power retractable system. This trim comes with either front-wheel-drive or all-wheel-drive. At the top is the Limited trim which upgrades the performance under the hood to a 2.4L Tigershark inline four-cylinder engine with a nine-speed automatic transmission. Other luxurious touches feature a leather interior, chrome and silver finish exterior accents around the front grille and side mirrors, and the optionally removable roof panels. Once again, you can choose either a front wheel design or all-wheel-drive depending on your driving conditions and preferences. Finally, there is the off-road-ready Trailhawk trim. Based off of the top-of-the-line Limited model, this trim uses the same 2.4L inline-four engine and nine-speed automatic transmission. On the outside, it gains front mounted tow hooks, a beefier, off-road-oriented suspension system with underbody skid plates, and the same removable roof panels. Since this trim is meant to go where the terrain is challenging, it only comes with the all-wheel-drive drivetrain option. All of these trims start at different price points, meaning you can choose whichever one will better fit your budget or driving style. If you want a vehicle that will remain in the city or on the route of the daily commute, the three primary trims will be more than enough. If, however, you feel the call of the wild outdoors, the Trailhawk offers more traction, suspension, and protection off-road. The 2018 Jeep Renegade does a great job of providing an affordable, off-road capable option for potential customers new to the Jeep brand. Even returning customers may find the Renegade attractive when a small SUV is required. It’s important to remember that the Renegade is basically an entry-level Jeep. While the Wrangler and Cherokee models offer more space, performance, and overall capability, this all comes with a larger price tag. The Renegade, however, provides many of the same basic features at a more affordable price. More importantly, the extensive trim line of the model provides ample opportunity to customize and upgrade when desired. Come check out the new Jeep Renegade today on the Faricy dealership lot. We can answer any questions, arrange a test drive, or otherwise help out any way we can so you have all the information you need to buy your next vehicle with us. 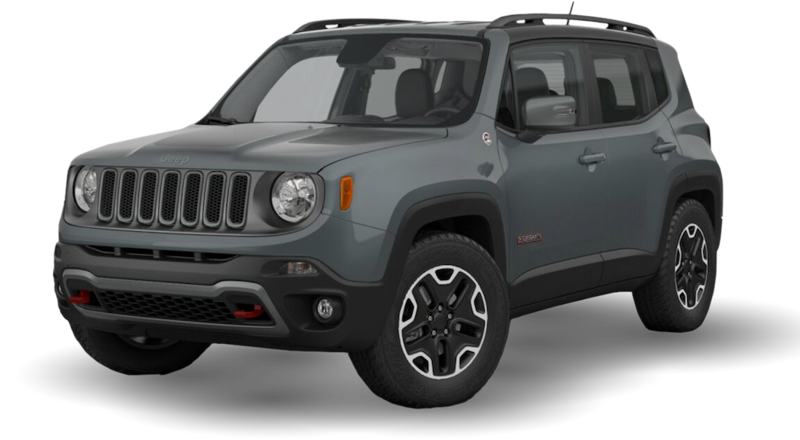 If you’re looking for the 2018 Jeep Renegade in Colorado Springs, we should be your first and only stop for a quick and easy buying experience.